English Landscapes Maintenance was awarded a seven-year grounds maintenance contract with Sefton Council to maintain the parks, green spaces, civic buildings, sports ground and play areas within the Borough. Setup scheduled jobs with Site, Team, Feature identified by a client code number, Quantity, Frequency and yearly schedule. See Fig 1. Features (for example Clip Back Shrubs) are categorised by a feature type (for example Amenity Shrubs) which in term is categorized by feature groups (for example Horticulture). The contract is divided into geographical areas, sites. Sites with increased visibility can be given a higher weighting for monitoring scoring. Calendar is divided into 13 x 4 week periods, with handling for extra week when required. Teams are allocated to sites, allowing for multi-skilled cluster working. Job sheets printed allow for teams to report task completion. See Fig 2. A sample of sites can be selected on a weekly basis for monitoring of quality of work, (score out of 10). See Fig 3. All sites are checked on a regular frequency, dependent of the priority of the site. Users profiles are linked to Windows logins to allow different levels of Access. Flexible reporting allows combination of filters to be applied to quickly locate data. Reports can be used to identifies possible patterns in team under/over performance. Reports allow selection at which level of detail: Feature, Type or Group. 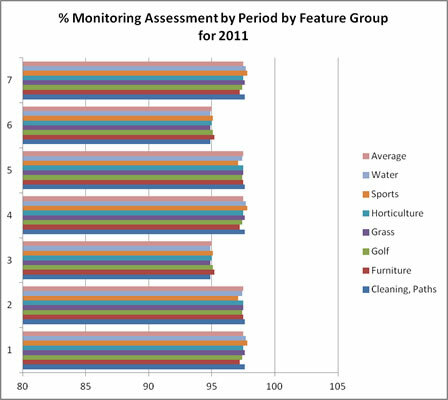 Comparative reports can be graphed for example % performance by Team compared by period by period. See fig 4. Import and export to/from excel facilitates bulk updates. This grounds maintenance planning and scheduling software is ideal for Councils/Contractors. It is an efficient way to replace spreadsheets, protecting data within a structured database, to deliver greater consistency and flexibility and integrated reporting. "Paul impressed in both his ability to understand our requirements, and to deliver a very user friendly solution. He is very flexible and responsive both to changes and delays during the project implementation, and in delivering subsequent amendments quickly. Costs are proportionate and realistic. grounds maintenance, monitoring, inspection, scheduling, planning, grounds maintenance software, municipal, local authority, horticulture, green space, play areas, parks, street furniture, budget, grounds maintenance planning and scheduling, sites, teams, tasks, performance monitoring, scoring.